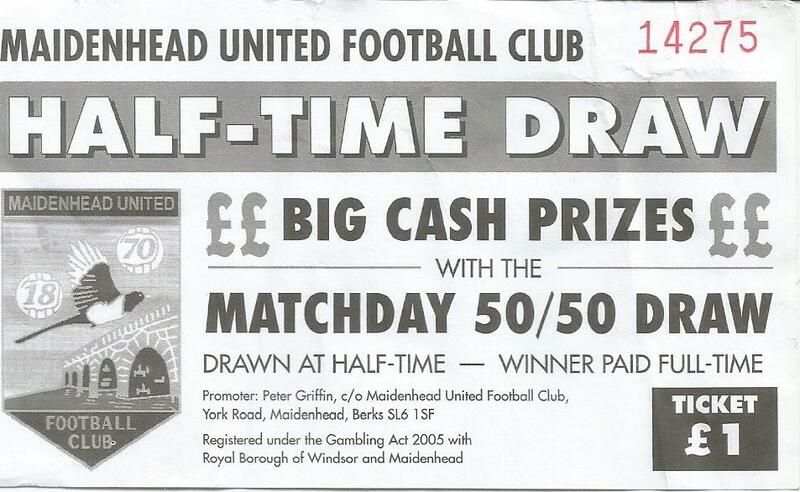 Maidenhead United FC were originally formed as Maidenhead FC in 1870. The club come from the town in the Thames Valley twenty five miles west of London and have a rich history in the game. On the 16th February the club played its first ever game at the York Road ground, which was previously just used for cricket. They were one of fifteen entrants to compete in the first ever FA Cup competition. The following season they reached the semi final stage. Maidenhead continued to be pioneers by entering the first ever Berks & Bucks and Amateur Cups. In 1894 Maidenhead became founder members of the Southern League, but found the competition too strong so they withdrew to play in regional football. 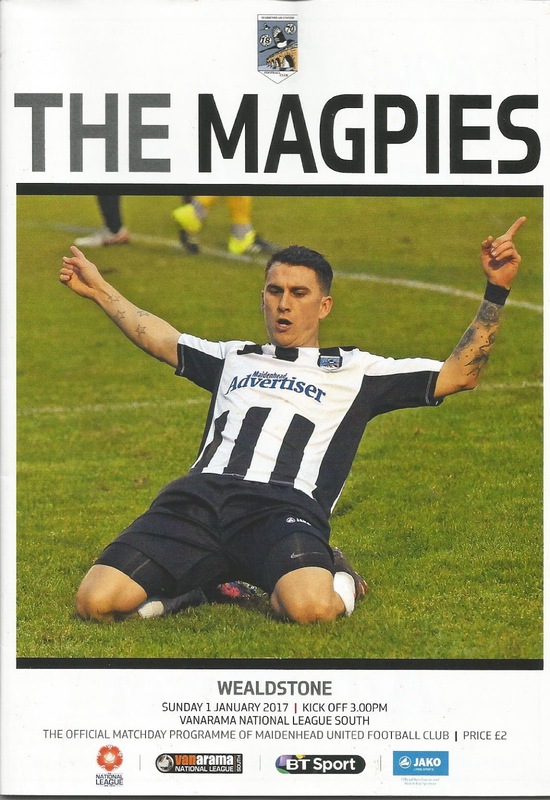 Another club in the town, Maidenhead Norfolkians played at Kidwell Park and the two clubs amalgamated after the Great War to form Maidenhead Town FC, adopting the club colours of black and white stripes which is where the club nickname of 'The Magpies' is derived. In 1920 the club changed to their name to Maidenhead United and in 1936 they reached the semi finals of the FA Amateur Cup before going down at West Ham to Ilford in front of 18,000 fans. The quarter final had seen United see off Southall with 7,989 creating a York Road record attendance. After the Second World War United played in the Corinthian League and between 1956 and 1962 they lifted the title three times, as well as making three appearances in the FA Cup First Round. In 1963 The Magpies moved to the Athenian League before joining the newly formed second division of the Isthmian League in 1973. In 1985 the reached the Premier Division before suffering the clubs first ever relegation in 1987. The loss was confounded by the destruction of the Main Stand in an arson attack as well as financial difficulties hitting hard. After several mangers tried to revive United's status, the former West Ham United and England star Alan Devonshire took over the reigns, with the team going on to lift all three County Cups in 1998. United were promoted back to the Premier Division in 1980 as improvements were made to the ground. At the start of the 2002–03 season Chairman Roger Coombs announced he would step down at the end of that season which led to Devonshire also going after the final game. The following season United finished in a high enough position to secure Conference South football the following term. Managers came and went and the club struggled with severe finances in 2005. The original club was wound up with ownership being transferred to a new Limited Company set up by sponsors Pharmalink and headed by Una Loughrey. The season ended in relegation and a return to the Southern League after an absence of over a hundred years. After a poor start to the new season the former manager of giant killers Yeading, Johnson 'Drax' Hippolyte was appointed and he didn't disappoint. The FA Cup First Round was reached for the first time in thirty five years and promotion back to the Conference South was secured via the play offs. The club set up a ladies side in 2009 and Hippolyte carried on his magic before budgetary cuts affected the squad and the club were denied a grant to extend the stand to Conference National requirements. Despite finances being tight, the side regained their status. In 2013 the club unveiled plans for a new cantilever stand on the Railway Side of the ground. The stand was open in 2014, as Hippolyte departed at the end of the 2014-15 season to be replaced by the returning Devonshire, while the club became tenants to the homeless Hayes & Yeading United. 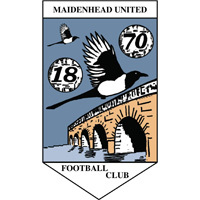 Maidenhead United FC will compete in the Conference South in the 2016-17 season. I was on early shift at work and still in the process on settling into my new Kingsbury flat. The weather was stunning and England were in the process of demolishing India in the Second Test. It was Yorkshire Day and I wanted to enjoy the evening. 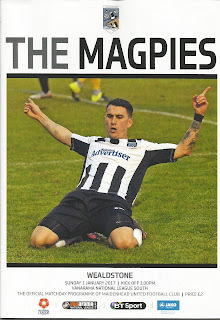 After looking at the fixtures in the Non League Paper it was either Erith Town or Maidenhead. I decided on a ride west after my brother Nick confirmed the match was on and County were apparently taking a strong team, so after an hour in the gym (honest!) it was down to Paddington. A train was going shortly and at around 6.15 I was alighting in Maidenhead after a stuffy ride. I eventually found a cash machine in the modern town centre and set off for the ground, conveniently finding The Greyhound, a Wetherspoon pub on the way. After a fine pint of Loddons I decided to enter the ground and give the club some trade in the Stripes Bar, which was advertised on the web site. I entered the ground to be greeted by a friendly Yorkshireman programme seller who commented on my Scarborough Athletic shirt, telling me how pleased he was that we continued football in the town and he was heading up for the cricket in a couple of weeks. This was a good start and put me back in a good mood after paying a tenner to get in and £2 for the programme, which I thought was a bit on the steep side. I entered Stripes to find it virtually empty save for a couple of WAGS and their mums. I plumped for a bottle of Newcastle Brown as their were no hand pumps and settled to read the programme. This was not easy as blaring rap and heavy duty clubbing music was blaring out from a local radio station. It was a proper sign of me getting older. Nearer kick off a few home fans came in. Judging by their language it was clear County had sent a weaker side than expected. We had a chat about clubs being raped of their home grounds. I learnt that the former owner of Wokingham Town who sold the ground and left was the same man who ended making Slough Town homeless! Will football fans with trophy dreams ever learn? I went outside to have my first proper look at the ground and I loved what I saw. It was a proper football ground. The York Road Side was split into three sections. There was a decent sized open terrace near the turnstiles, then flat standing with the changing rooms and clubhouse behind and then a strange structure like an open sided concrete barn. This doubled up as a car park and a training facility. A walkway with raised viewing area in front for disabled fans stood in front of this cover. The far end had a few steps of terrace with a basic cover. After a couple of steps of open terracing, the Railway Side had a covered seating stand with a larger open terrace at the far side, with a club shop at the rear. Lovely trees provided a barrier between the ground and the railway embankment. The terracing continued around behind the goal which had a lovely painted mural on the back wall and another basic roof covering supporters in the middle section. After a small gap for the grounds second entrance and exit, another terrace and cover completed the ground. A tea bar which was like a small pavilion sat in the corner to help the fans hunger, mine included! In a way County helped the match by sending a second strength team as it made for an equal competitive and hard fought encounter. Notts boss Martin Allen looked on as his youngsters played some quick passing football, but The Magpies of Maidenhead were equal to them. He had looked to sign home striker Alex Wall, but the deal had broken down, so Wall was keen to impress. He linked up well with the returning live wire Manny Williams. A fan shouted out "C'mon The Pies" and when people looked round, he corrected himself to "C'mon the Notts Pies" to laughter. Williams opened the scoring before half time. After numerous subs the game took a while to get going after the break but then in a ten minute spell after the sixty ninth minute the crowd were greeted to four goals. County equalised before Williams added a second following a goalmouth scramble. 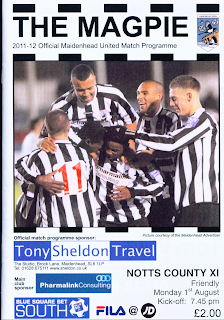 Again Notts replied to much jubilation from the young side before home winger Worsfold who skillfully beat his man before cutting inside and driving home to much joy from the youthful support behind the goal. I gave it another five minutes before leaving from the exit behind the goal and walking down Bell Street to the ground. It took me less than five minutes to the platform for the London train. I thoroughly enjoyed my visit to York Road and would recommend it thoroughly. My only reservation was the music in the clubhouse, but that's a minor gripe. The club claim that the ground is the oldest used continually by one club as verified by the FA. I think Hallam FC may have something to say about that, but no one can deny that York Road is a ground full of character and one that given its location is ideal for any traditional fans of the game. Having seen in 2017 in on night shift at the pleasant and thankfully relaxed Ruislip station I awoke, had a quick bite to eat and made my way to North Harrow, where my regular non-league travelling chum, Tony Foster picked me up. It was a miserable dark and wet day, but thankfully traffic was light as we parked up a few minutes away from the ground and paid a very fair £10 admission price and another couple of quid for a programme. Despite maidenhead being a division above Staines, where I’d been the previous day, their prices were £2 and 50p cheaper. We found a space in the Stripes Bar as I toasted the New Year with a fine pint of Rebellion IPA, from a pin behind the bar. Ten minutes before kick off we headed round to the far side to take our seat in the stand. This new structure was the only change I could spot since my previous visit. It offered an elevated pillar free view of the pitch; the only one slight downer being the rain was blowing towards us on what was turning into a bitterly cold afternoon. I read and agreed later with comments on the excellent Non League Matters forum about the far side of the ground not being the most pleasing on the eye. But then a slate grey sky and driving rain has never done anywhere many favours. My main grumble was the huge queues to do away with any chance of a warming cuppa and having to queue for the small sized toilets. I'd have been working on them as a priority before worrying too much about any aesthetics, especially with promotion looming. Stones, backed by their usual vocal following, were put under initial pressure by the clear league leaders. Jonathan North pulled off an outstanding save from a header. His side should have probably gone ahead a few minutes later. Ricky Wellard’s shot could have found the far corner, but Elliott Benyon slid the ball home, only to be adjudged to be in an offside position. He also missed a guilt edged chance ten minutes later, while Maidenhead tried to force a way through a resolute Wealdstone defence at the other end. The score remained blank at half time. Tony pointed out that United had only let in four goals at home in the League all season, but in three matches, they were yet to defeat Wealdstone. 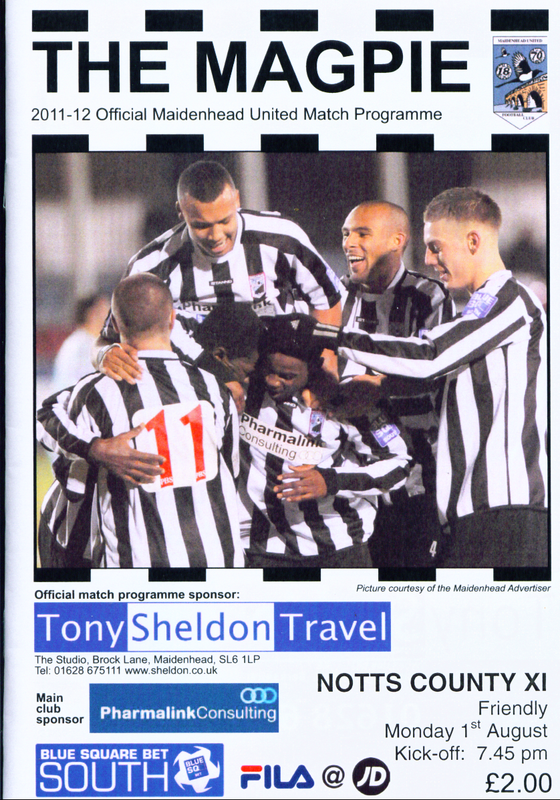 The Magpies took the lead soon after the restart when the prolific Dave Tarpey’s shot from twenty yards took a deflection off defender Edward Oshodi, sending an apoplectic North past the ball, which went straight up the middle of the goal. Stones missed another couple of half chances before the game was more or less sewn up with twenty minutes remaining. Tarpey found room on the right, crossing hard for Sean Marks to bullet his header home at the near post. Wealdstone, to their credit, never gave up. Benyon nearly fired home from a narrow angle, and Carl Pentney showed why the home side had such a fine defensive record as he capped a fine performance between the sticks as the game was drew to a conclusion. The game had reminded me of my days as a young un with my Dad in The Shed cheering on Scarborough in the Northern Premier League against the likes of Wigan Athletic, Runcorn and the likes as the players got stuck in; never shirking a challenge. Proper football! We were extremely cold by the time we got back to the welcoming warm of Tony’s car for a relatively trouble free journey back to Harrow. I was home and eating by 6.20pm in time for a lovely nap on the electric blanket before work.